Singer and antagonist Morrissey joined Twitter way back in 2009, but (fortunately for us) he’s never taken to the micro-blogging platform to share his often controversial views about vegetarianism, Chinese people and the correlation between extinct rhinos and Beyonce’s handbags. Well, until now. It’s probably no coincidence that the former frontman of The Smiths is starting to promote his new album, ‘World Peace Is None of Your Business’, at the same time as he turns to Twitter to talk about his music and his controversial views. 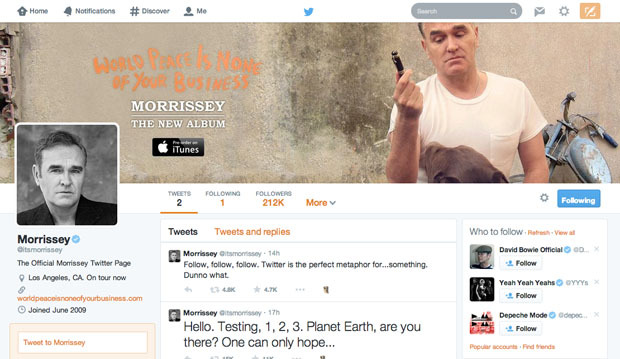 3 months till Morrissey leaves Twitter, put your house on it, your cat on it, your Eurovision winnings on it. Morrissey's third tweet should be "Meat is Murder". And his fourth tweet should be "Custard is Manslaughter". And so on. Doesn't Morrissey realise Twitter's a place where people with extreme views hurl viciously barbed insults at…oh yeah, he'll be fine. It&apos;s now possible to sell your used games to CeX for Bitcoins!